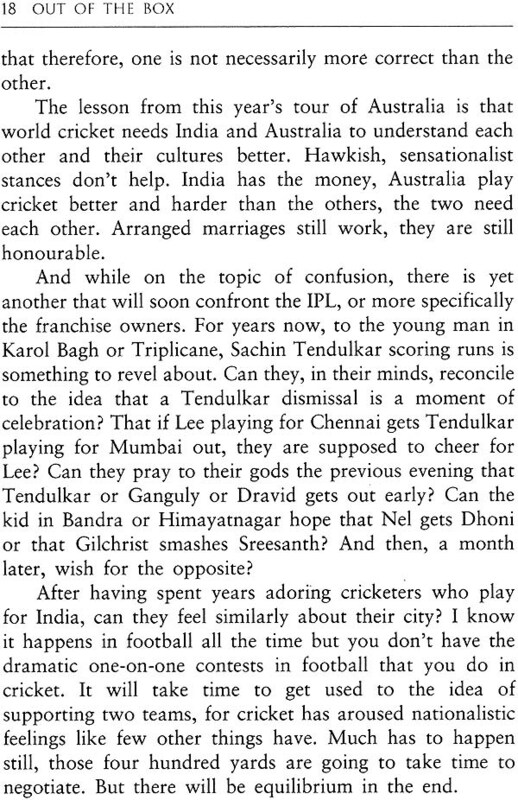 Aptly described as 'India's first non-playing cricket celebrity', Harsha Bhogle has captured the entire gamut of Indian cricket in his weekly column in the Indian Express: from the advent of Dhoni to the decline of the Fab Four: from the art of coaching the Indian team to the BCCI’s money-mindedness: from cricketers shooting commercials Just before a match to the nail-biting finish of many an IPL clash. 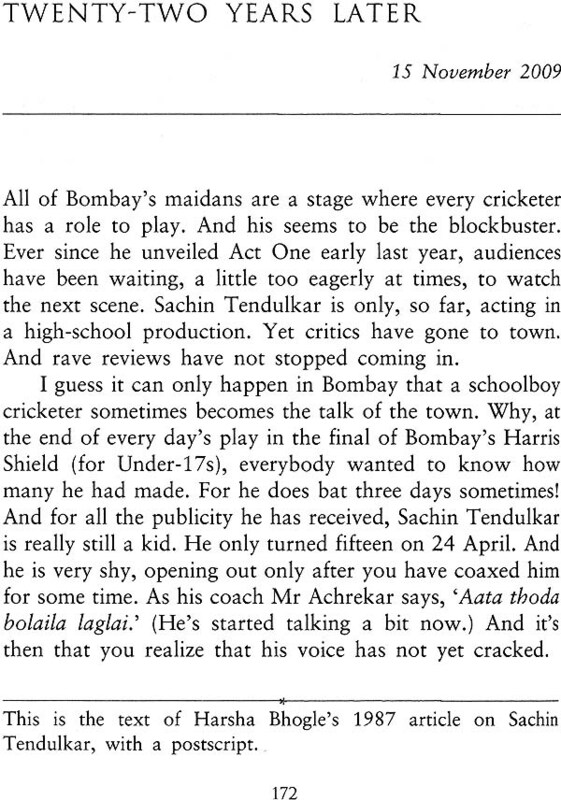 Out of the Box brings together the very best of Harsha's writing, In a book that will be a veritable delight to any cricket fan. This new and revised edition contains thirty new pieces, going up to India's World Cup win and the appointment of Duncan Fletcher as coach. 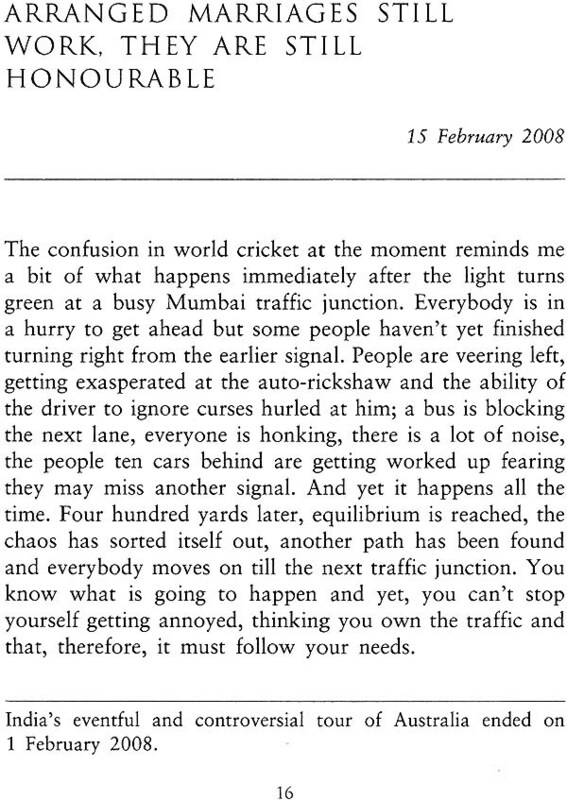 Knowledgeable, frank and witty, and with a sense of drama comparable to that of cricket itself, Harsha is a master at evoking the many moods of the game. From suspect bowling actions to shorter boundaries, from the four bowlers vs five debate to the controversy over the rotation policy, from the heroics of Virat Kohli and Suresh Raina to Anil Kumble's 600th scalp, he brings the nation's cricketing ethos inimitably to life. And he is at his best when paying tribute to cricketing greats: Lara, Jayasuriya, Ganguly, Laxman, Dravid, Sehwag and the incomparable Tendulkar. 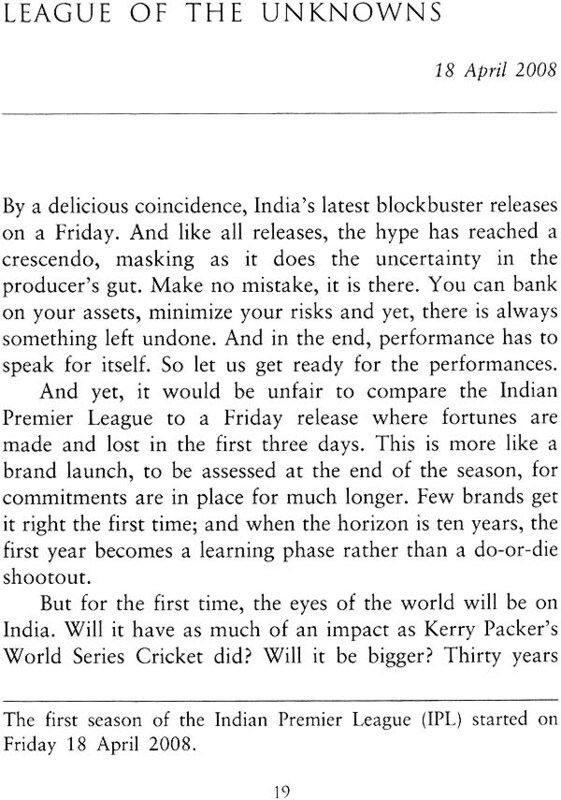 As he follows India's fortunes on the cricket field at home and overseas, Harsha asks the question that is on everyone's lips today: can India really be no. 1 in all three forms of the game? 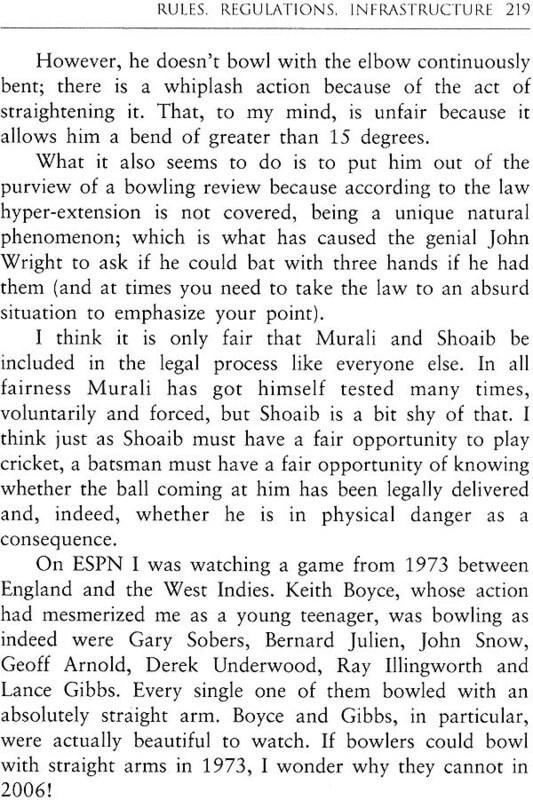 The answer lies in our history-and in the pages of Out of the Box, one of the most outstanding books ever written on cricket in the subcontinent. Harsha Bhogle is widely recognized as the face and the voice of Indian cricket. 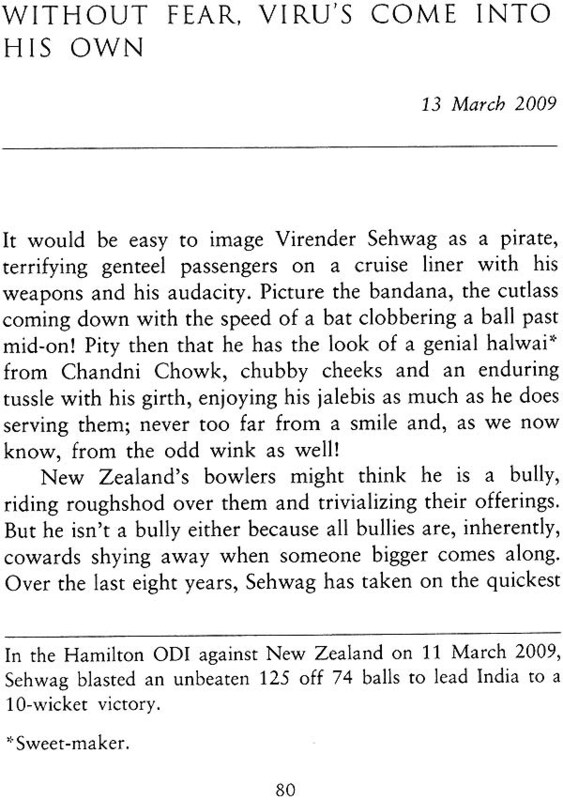 He brings to his profession an unusual set of gifts that give him a distinct identity in the cricket world. Harsha is many things: a chemical engineer who graduated from India's number one business school IIM Ahmedabad, an advertising executive, an iconic television presenter who spawned a TV reality show called Hunt for Harsha (Harsha ki Khoj), a commentator who is popular across cultures, a sensitive talk show host, a corporate motivational speaker (an enterprise he runs with his wife Anita), and a writer with a great feel for the game and its actors. A recipient of numerous awards, he was voted the 'most favourite cricket commentator' in a worldwide poll of readers of Cricinfo.com in 2008. One of his proudest possessions is a photograph of a group of spectators in Pakistan holding a banner that says 'Harsha Bhogle fan club'. Harsha has been the face of ESPN in India since the day they went on air in 1995, and presents cricket-and, in an interesting diversion, the football World Cup in 2006-for ESPN Star Sports. He has worked on all the major radio stations in the cricketing world as well, with a special affinity for Australia, which he first visited in 1991-92, where he was dubbed the 'sexiest voice on radio'. He is close to achieving the double of working on 100 Tests and 400 one- day internationals, the first of which was in 1983. Originally from Hyderabad, and still enamoured of the flavour of the city, Harsha lives in Mumbai in a close-knit family with his wife Anita (an IIM Ahmedabad alumna) and sons Chinmay and Satchit. The first time I met Harsha was when he interviewed me for a sports magazine when I was fourteen. I vividly remember that evening. 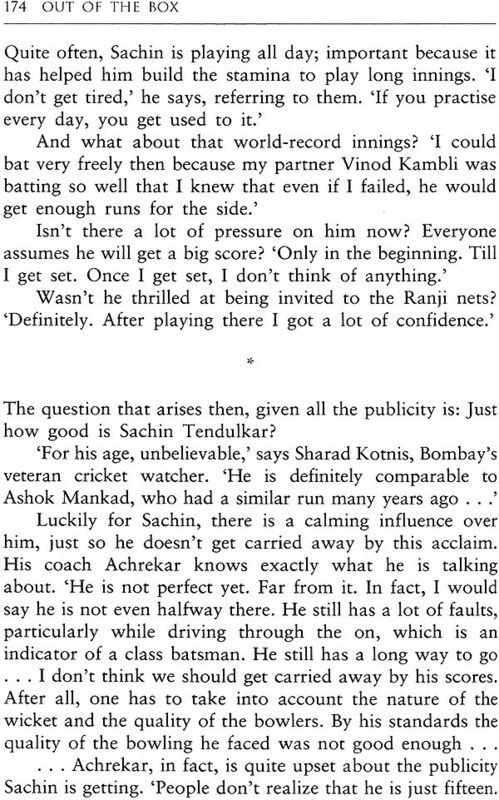 We sat on one of the pitches in Shivaji Park and the interview slowly transformed into a larger discussion on cricket. Having seen Harsha grow over the years as a commentator and presenter, I am in high spirits as I write this introduction. Cricket as a sport is a passion for millions in our country and here is an individual who chose to be different to the extent that he envisioned a career path which was unknown to many even a few years ago. Harsha epitomizes what you can achieve if you really put your heart and soul into a cause. 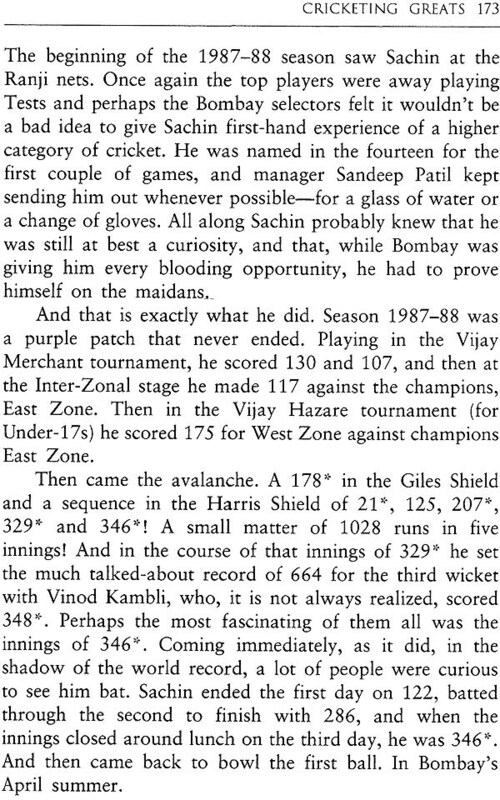 Despite his self- confessed dreams of playing for India not materializing, he has still managed to stay connected to the game and contribute substantially over the years to our understanding of cricket. When you meet Harsha, first things you notice are hi sense of humour and his keen eye for detail-not to mention his infectious laughter. On a more serious note, I have come to realize that speaking to him sometimes opens up completely different perspectives in addition to the ones I already have. He has a high cricketing acumen, which has not only helped him carve a niche identity, but also sustain himself in the television commentary space amongst legends of the game. I'm sure this book will not only inspire readers to chase their own dreams but also empower them with the best practices on how to lead the field and become world-class in their professional life. The box has been my identity and my boundary. It has given me opportunities I could not have dreamed of, introduced me to some lovely people and allowed me to be part of some beautiful moments, but more than anything else it has allowed me to enter people's houses and, sometimes, become friends with them. Television can be a very powerful medium, but it can also be limiting. The escalation of television rights means commercial intrusion is inevitable. You have to be precise, a quick jab with a word or a comment, and out before the break. You can't paint a picture with someone waiting to take the brush away. That is the reality of modern television, and commentators must adapt. But with a laptop in front of you, and an empty screen, you can reflect, ponder aloud over issues, fret over a word, erase it, dab a little more colour here, a little detail there and present a finished product that is yours, and yours alone. While television rewards spontaneity, the written word demands weightiness. It is a completely different genre but one that is crippled by insensitivity to words. Words are a writer's wand and his weapon. They evoke feelings and paint pictures for the reader. They must be respected. 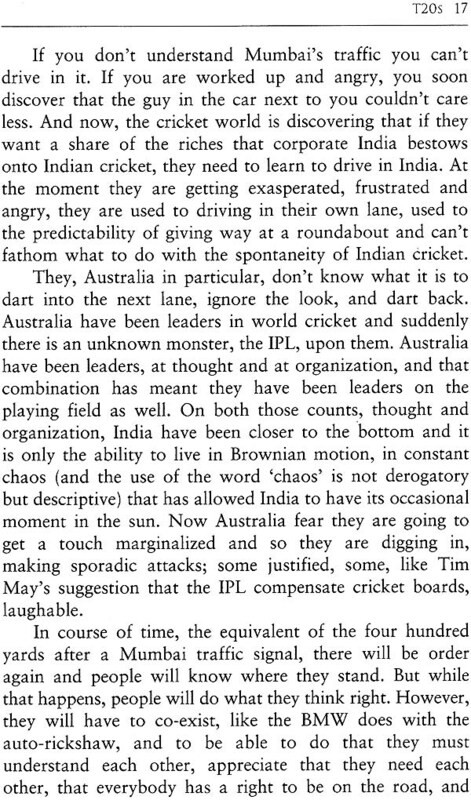 Not everyone can write like Peter Roebuck or Rohit Brijnath, but, even in our limited sphere, we must use words carefully, not toss them around. 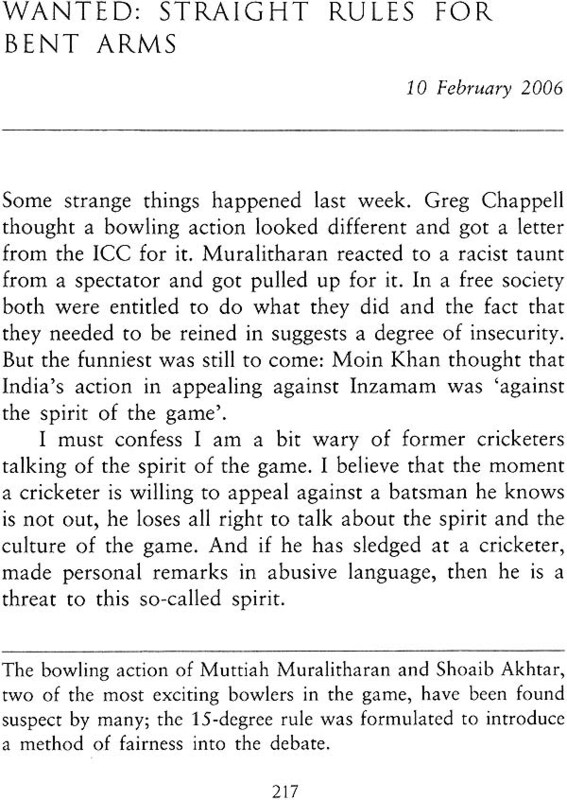 Good cricketers we write about don't offer just any shot to a ball. 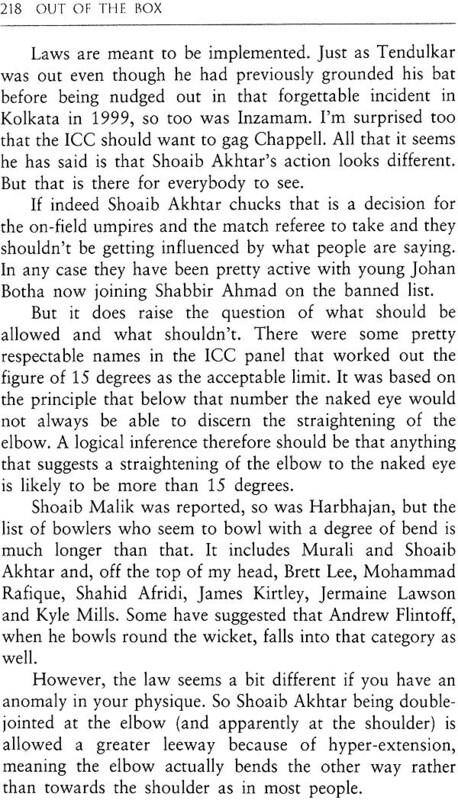 So too must cricket writers pick words they believe are most appropriate. Peter once told me of the twin loves of his life: cricket and the English language. They work well together, certainly in our game which lends itself to fine writing. Writing a weekly column can present a different challenge. True, you have the entire week to reflect on what happens, but inevitably, there is a rush towards the end. Sometimes the defining moment comes on a Monday, too early for a Thursday deadline, and so passes you by. At others it comes late on Thursday evening and you have to appear weighty and yet spontaneous. But that is part of the challenge for the columnist and overall it can be fun and rewarding because you have an address and people know where to visit you. I have been very happy with my address at the Indian Express. They have been good to me, have honoured my only request which was not to edit my pieces, because then they wouldn't be mine any more. And now they do me the honour of putting together a selection from all that I have written for them into this anthology. It means a lot to me. Being in cricket has been a mighty blessing, this makes it sweeter. Over the years some of what I have written is still relevant, some of it has withered with time. So do look upon this book as a collection of snapshots, some fresh, some dated, hopefully pleasantly. You cannot always cater to the immediate and aspire for posterity. I'd like to thank Shekhar Gupta for this. 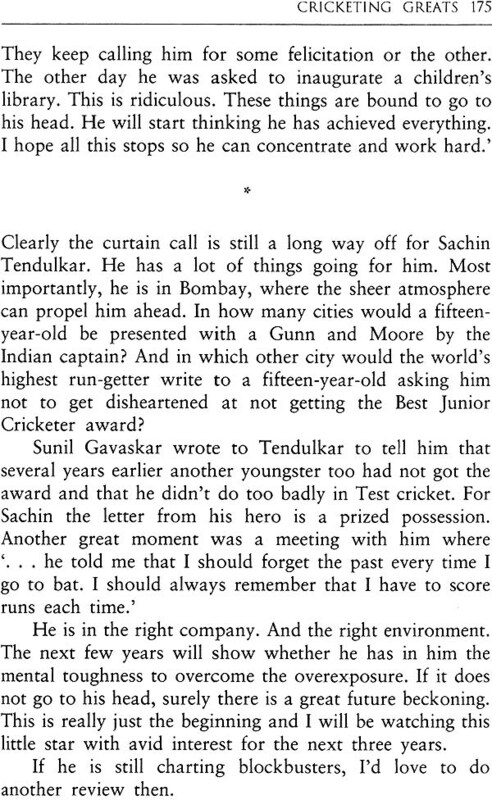 He called me some years ago, we agreed in the first couple of minutes on the column, and talked cricket for a long time after that. 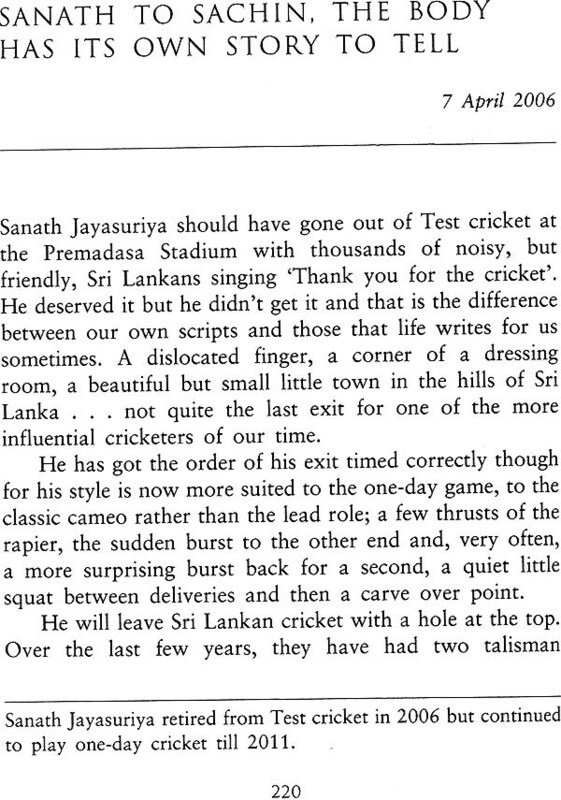 His sports editors have since become friends. 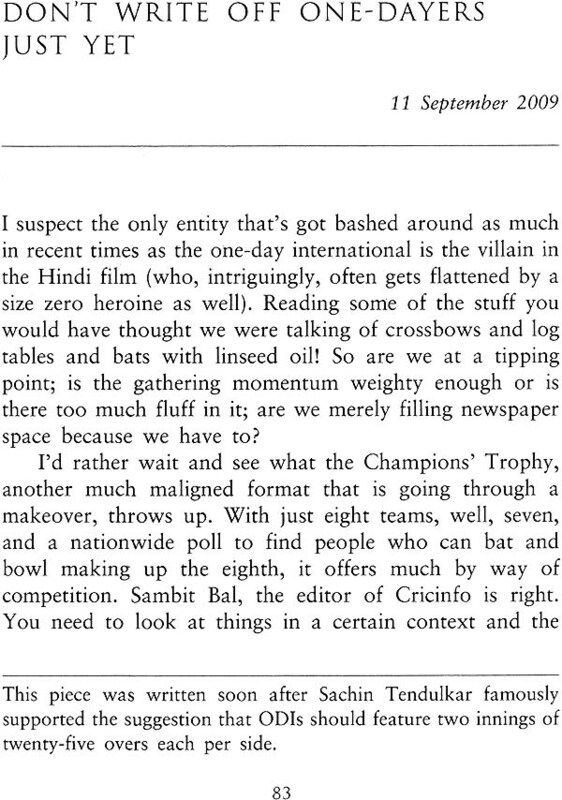 First the football-loving, jovial Jayaditya Gupta, followed by Ajay Shankar, who knows all that is happening in Indian cricket, and then Kunal Pradhan, who brings a fine style to his own writing. And I would like to thank Sachin Tendulkar. He has given me so much pleasure over the years and not once has he behaved like the massive star he is. And now he has honoured me deeply by writing an introduction to this book. 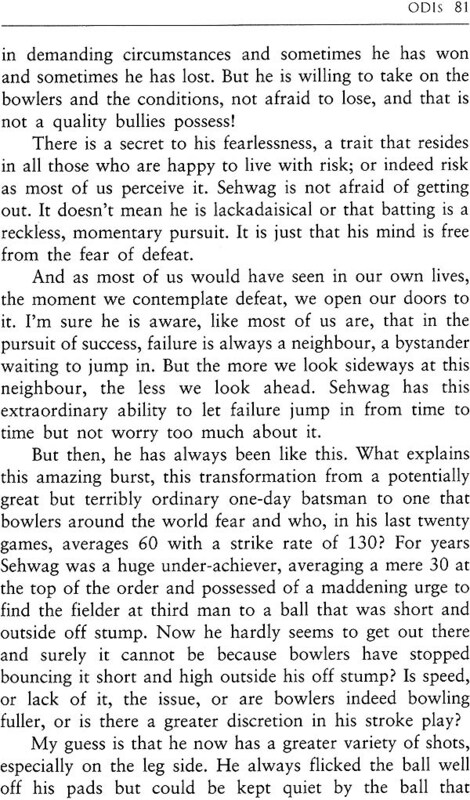 I hope cricket grows stronger because it has defined our existence, certainly mine, for so many years, whether in the box or out of it.